Fire and smoke shoots out at the Paletta meat-processing plant in Burlington, Ontario, Canada. No one suffered an injury in the blaze, but but the building ended up destroyed. A massive fire destroyed half of the Paletta meat-processing plant Wednesday in Burlington, Ontario, Canada. 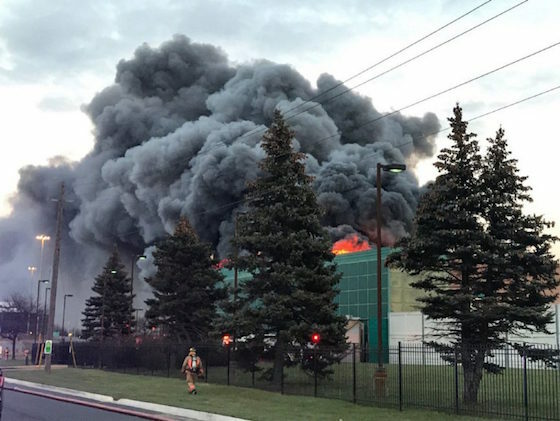 Paletta International Corporation fell victim to the blaze near Appleby Line and the QEW after the fire broke out around 4:10 p.m., fire officials said. Firefighters from three departments ended up called to the scene. “The whole east side of the building has been more or less consumed by the fire. Our focus now is in trying to protect the west side of the building,” Burlington fire chief David Lazenby said around 9 p.m. at the scene. All workers that were in the large building at 4480 Paletta Court when the fire started made it out without injury. No firefighters were injured, either, Lazenby said. Lazenby said crews quickly moved to contain the fire rather than going in to put it out. Fire officials said there was also some concern about entering the building because ammonia tanks were known to be on the premises. “There are some tanks containing ammonia inside the building and as a precaution and with the smoke it was best to ensure people were safe,” Insp. Ivan L’Ortye from Halton Regional Police said. Employees at neighboring buildings in the industrial area were advised to stay inside due to the smoke. Police said an inspector from the Ministry of the Environment has already investigated the scene. Air quality tests were conducted and no dangerous fumes were detected, officials said.